Matt Baggott spoke out after it was reported that a device left in a car on Sunday night in Belfast had contained more than 120 pounds of home-made explosives. A detonation was herd in the car between Musgrave Street PSNI base, Belfast’s largest police barracks, and the Victoria Square shopping centre car park. The area had been cleared hours earlier after the driver of the vehicle, who said he had been forced to transport the keg-style device, raised a warning. The explosion took place just before midnight and as a British Army bomb-squad robot approached the vehicle. The car itself was damaged and the blast was heard across the heart of Belfast, but it did not damage any other structure. The device is said to be the first such attack in the city centre for more than a decade, and one of very few to even partially detonate this year. The group known as ‘Oglaigh na hEireann’ later claimed responsibility. In a statement to a Belfast newspaper, it said the bomb contained over 150lb of commercial explosives and “was intended to cause maximum damage to an economic target”. It added that it “would continue to target commercial premises in the future”. Last month the same group was said to be behind a fire-bomb attack which damaged a discount store in Belfast city centre. At that time, the group accused the shop of ‘exploiting staff’ by taking on staff from low-paid government schemes. The car bomb incident also took place on the eve of the 100th anniversary of the founding of the Irish Volunteers [Oglaigh na hEireann in Irish], the organisation which would ultimately become known as the IRA. Later in the week, in scenes associated with the height of the conflict, uniformed British soldiers and the PSNI joined forces in forming a raiding party which attacked and arrested north Belfast residents. The evident return of British soldiers to a street-level role infuriated Ardoyne republicans and contradicted a vow made by Baggott in recent weeks when he said that he would not call up British troops for support because it would “not be good for northern Ireland”. One prominent republican, Alan Lundy, was seized in the raids and taken to Antrim interrogation centre, while another man, Christopher Headley, was assaulted amid a violent and destructive invasion of his home. His daughter and 18-year-old daughter Claire were also assaulted and verbally abused during the search in Brompton Park. Crown forces forced their way into the house at 8am with a warrant stating they were searching for “component parts of bombs, wigs, a patterned dress, documents, computer equipment and mobile phones”. Ms Headley said the way the search was carried out was “very aggressive and totally unnecessary”. “At first they refused to show me the warrant. My mum and dad were in bed and I asked them to wait while I woke them up but they just pushed me out of the way and came into the house. “My dad was dragged out into the garden, we tried to tell them he has a heart condition but they just weren’t interested. “They turned the place upside down and then just left it like that. Despite the list of things they said they were looking for all they took was a halloween dress up wig”. Meanwhile, the PSNI have also re-established road checkpoints in the greater Belfast area, which they blamed on the possibility of further attacks, but is also understood to be linked to the threat of loyalist flag disturbances. Fianna Fáil’s Eamon O Cuiv, said he believed “vested interests” were deliberately exaggerating the threat of republican armed groups. The former Irish government minister was speaking at a conference on policing and injustice held in Derry at the weekend. THe said that as well as being concerned about internment, he was also concerned about the role of the Crown forces in the north. He expressed concern about the role of British military intelligence in so-called ‘dirty tricks’, citing the example of County Louth republican Michael Campbell who was arrested in 2008 following an elaborate sting operation. Mr Campbell spent nearly six years behind bars until his conviction was overturned on appeal earlier this year. Meanwhile, bomb alerts have continued in Belfast and elsewhere, including the discovery of a suspicious object close to the North/South electricity interconnector. 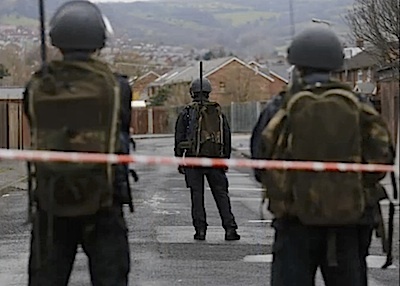 The keg-style device was found near the village of Crossmaglen in south Armagh on Wednesday, and British army bomb disposal experts have now spent more than four days dealing with it. The interconnector is a high-voltage powerline that transfers electricity between the powergrids in the north and the 26 Counties. It was abandoned in 1975 following a number of IRA bomb attacks but was restored in the mid nineties. A device found on Sunday in south Belfast also led to PSNI road closures across a wide area of south and west Belfast, but was later declared a hoax.